You can wait a long time between trains in Astoria. The last scheduled passenger service between Portland and Astoria ended in January 1952. After that, save for a few excursion specials, the line has been used only to haul ever decreasing amounts of freight. Nothing is hauled on the last twenty five miles to Astoria. Things changed three years ago when the State of Oregon launched the "Lewis & Clark Explorer" to bring people from Portland to Astoria for the bicentennial of the Lewis & Clark expedition. Coordination between the necessary agencies eventually prevented the train departing from Portland's Union Station, but for the last three summers the "Lewis & Clark Explorer" ran Friday through Monday from Linnton, (north of the St. Johns Bridge) to Astoria. Two weeks ago, just before the service was scheduled to end its final year, Jill and I took the train to Astoria. 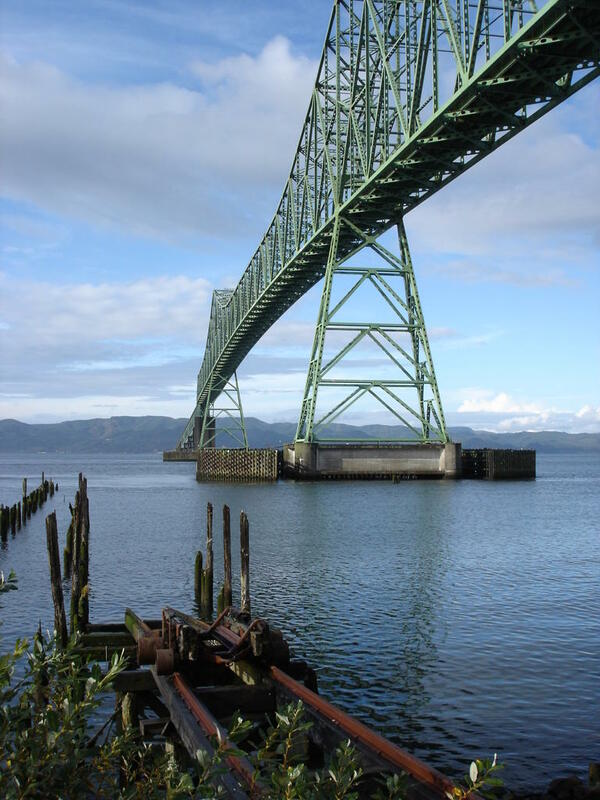 The plan was to ride the train, explore the city and run in the race across the Astoria-Megler Bridge scheduled for that Sunday. The train consisted of 1950's era self-propelled RDC (Rail Diesel Cars) bought second had from British Columbia. The cars are functional and comfortable, although because of their age they are expensive to maintain. It takes three and a half hours to get from Linnton to Astoria by rail. The first half of the trip parallels Highway #30 and offers little in the way of surprises for those familiar with that road. People waved at the train as we passed through the small towns of Scappoose, Warren and St. Helens. People like to wave at trains. The second half of the trip is more interesting. The highway pulls away inland while the railroad follows the Columbia River. Wildlife, especially birds, especially herons and cormorants abound. There is a close up view of the de-commissioned Trojan nuclear plant. Shortly thereafter the train passes moored ruins of the River Queen, a former San Francisco Bay ferry boat used for many years as a restaurant in Portland. Forlorn and rotting in a backwater, the River Queen is a perfect haunted derelict. The train ran down the center of the street through the oldest part of Ranier. At Wauna, seventy-five miles from Portland the railroad passes through a huge paper mill complex where Brawny paper towels are made (now you know!) At Point Adams along the Columbia River you are at the north-most tip of Oregon. 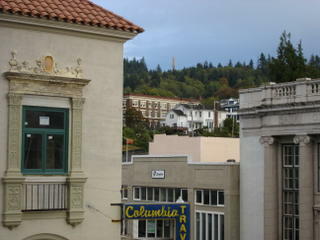 The Astoria Column from the Hotel Elliot. I like Astoria. It is far enough away from Portland so that you know you are somewhere else. It feels like a small city instead of a coast town. It has history. Astoria has been called "Little San Francisco" which is an apt nickname. Picture standing simultaneously on Astoria's waterfront and on San Francisco's Fisherman's Wharf. Both landscapes are dominated by large bridges. Both waterfronts have largely transitioned from fishing and shipping to the care and feeding of tourists. Both have a streetcar next to the piers to move the tourists around. Both have sea lions. 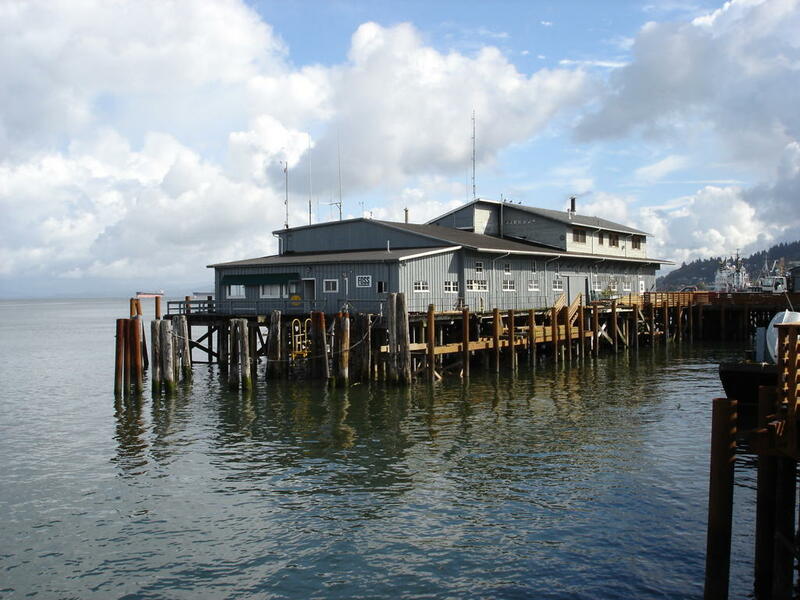 Each city has a waterfront museum. Both cities had their downtowns destroyed. San Francisco in the earthquake and fire of 1906, Astoria in the fire of 1922, which took out thirty-two blocks. Both cities have Victorian houses in the hills above. Both cities sport hill top erections (!) the Astoria Column and Coit Tower. 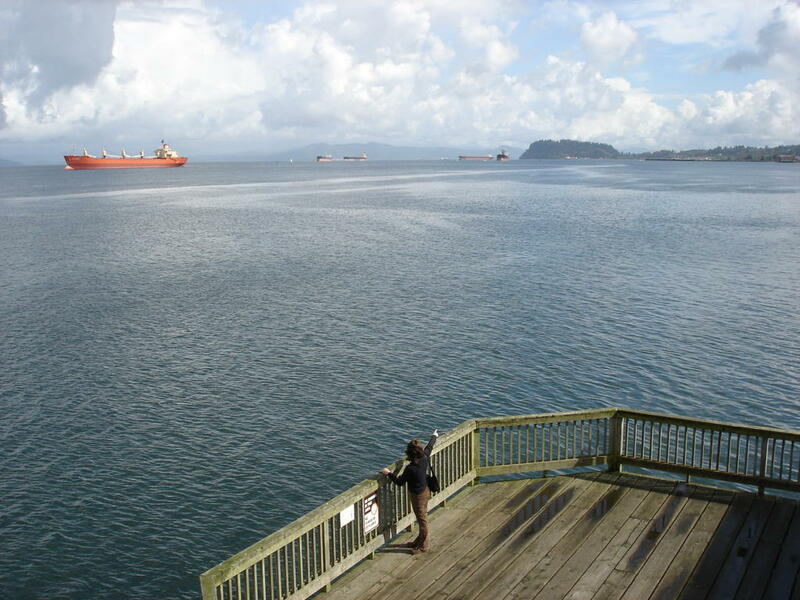 Depending on your perspective, Astoria can be a little like San Francisco or like a little San Francisco. It took us two days to explore the town on foot. 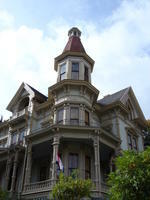 Along the way we took in the usual (the Victorian Flavel House) and the unusual (a shop that sold marbles). The Flavel House is a Queen Anne style wonder with fourteen foot high ceilings on the first floor. When I was a kid I lived in Newport Rhode Island where I went on more than a few mansion tours through the homes of the Vanderbilts and other tycoons of the Gilded Age. While not as grand as those homes (George Flavel owned a firm that piloted vessels through the mouth of the Columbia) the house is still very impressive. On the other hand, the shop that sold marbles was notable because it was just that, a shop that sold marbles. Marbles of every size shape and description. The owner was an enthusiastic true believer who would suggest and demonstrate stances and techniques to improve ones marble playing prowess. He gave us each a marble and pronounced them as lucky. He made me want to buy marbles even though I really had no use for them. I already had a lucky one, what more could I need? Now I kind of wish I bought one. The world is a more interesting place with marble shops in it. 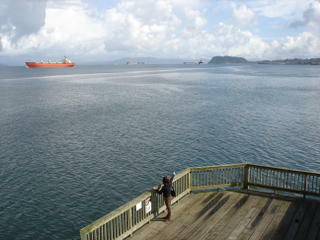 We walked from the waterfront up through the neighborhoods all the way to the top of the Astoria Column. Many of the houses had historic plaques, some made from old Route #30 highway signs, noting who had built the house and what they had done in the cities early days. In this way the place has an almost east coast feel to it. To the east of the Column there is a trail that goes one and a half miles to a large three hundred year old Sitka Spruce known as the Cathedral Tree. Fifty yards down the trail and it looks and feels as if you are in the middle of the Coast Range. It is hard to believe you are less than a mile from the center of town, save for the occaisional disorienting sound of sea lions barking from a distant waterfront dock. On the final day of our visit we ran across the four mile long Astoria-Megler bridge on the only day of the year that it is legal to do so. Five hundred runners and fifteen hundred walkers took part in the race which ended with a rainy finish. On the bus ride to the start of the race, people remarked on how nice it had been last year. Bright and sunny. Alas, this year it was not the case. cruise ship / rail operations on the Alask and White Pass & Yukon Railroads. It is an intreguing idea, one that could lead to trainloads of well off tourists travelling to Portland and Portlanders riding to Astoria for a weekend out of town. 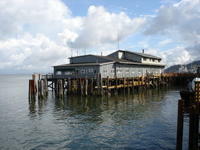 Beer: The Astoria Brewing Company's Wet Dog Pub on the waterfront. 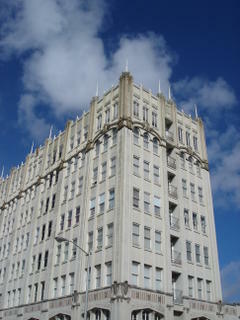 the Hotel Elliot (literally under the side walk). ships slowly spin at anchor while eating some excellent food. Spiders: Some of the largest ones ever, hanging off neighborhood branches and fences. Astoria (founded in 1811 is the oldest non-Native American settlement west of the Rocky Mountains. As a British outpost of the Hudson's Bay Company it was known as Fort George. 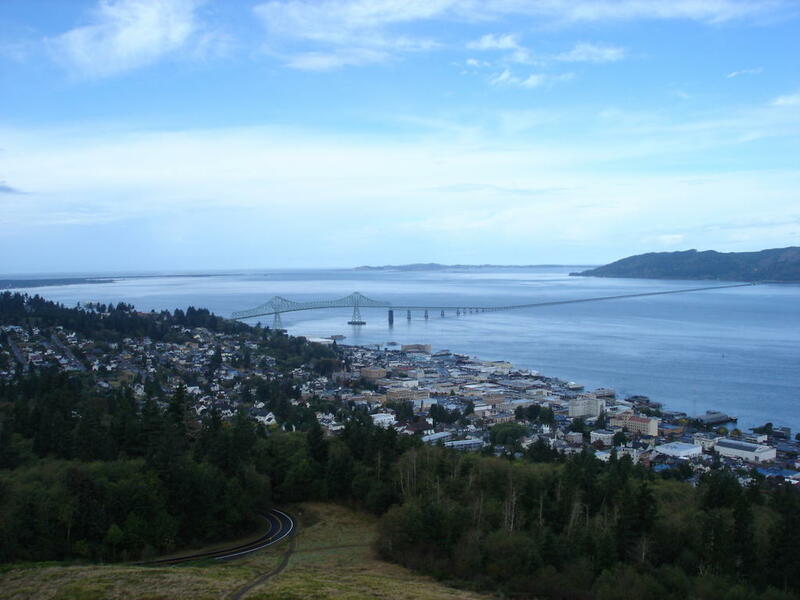 Only one third as many people currently live in Astoria now as there were at the height of the city's population. Great post! Astoria is a great town, one of my all-time favorites! And it's nice to hear that the River Queen is still out there somewhere, as it was one of my favorite restaurants while growing up.